The new standard of mobile first person shooter. Lock and load and give 'em hell, soldier. Gameloft's Modern Combat 3: Fallen Nation is in many ways a console quality experience delivered straight to your iPhone or iPad, with outstanding graphics, a thrilling (albeit stereotypical) single player campaign and addictive multiplayer that serves as a decent portable substitute to Battlefield 3 and the upcoming first person shooter, Call of Duty: Modern Warfare 3. First, the visuals look incredible. For anyone who dismisses mobile phones and tablets as being able to offer a graphically stimulating experience, prepare to shut them up. Modern Combat 3 is on par with (and even surpasses) some Xbox Live Arcade and PlayStation Network games, with outstanding detail on a myriad of different weapons, characters, vehicles and especially the environments. Seriously, take the occasional break from shooting terrorists to enjoy your surroundings, whether it's the war torn city of Los Angeles or the Alaskan wilderness. Everything about this title, including the sun glare, infinite draw distance and set pieces scream high quality. If this is the future of handheld graphics, we're in excellent hands. Thankfully, there's more to this game than just eye candy. Modern Combat 3's developers clearly drew inspiration from those aforementioned console shooters, designing a fun experience with some of the most impressive dual stick control schemes we've seen in a portable FPS; the game also comes with gyroscope aiming, but we prefer the former. Whereas past games feel sluggish and make turning a chore, here, everything moves fast and fluid. As for the combat, it's standard fare you've probably experienced countless times before. The majority of the campaign, for example, provides the typical fish in a barrel missions, as you move from location to location sniping enemies, laying explosive charges and picking up a rocket launcher to take down a helicopter. It's deliberately scripted in such a way that there are no surprises to speak of, no genre defining moment that elevates Fallen Nation, but we'll take it. Even the story's a bit cheesy. Here, you set off to defend the U.S.A. from the evil KPR, AKA the Korean Pakistani Russian Alliance. The narrative includes weapons of mass destruction, soldiers on American soil and even a very familiar but still thoroughly entertaining AC-130 gunship mission that has become the staple of the Call of Duty: Modern Warfare series. 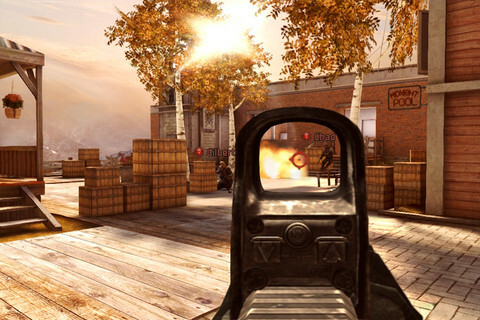 Despite these obvious nods to games past, though, Modern Combat 3's a blast. Predictable? Sure, but that matters little as you slowly creep behind a guard, press the action button and watch as your character stabs the fool in the throat (or snaps his neck like a carrot stick). The shooting, meanwhile, is appropriately dramatic and over the top, as the camera occasionally zooms in when you pop some evildoer in the head. We're also huge fans of Aim Assist, which lets us zip between bad guys while looking down the sights; you can turn this off. Naturally, the 13 mission story mode only lasts so long, with little reason to return. 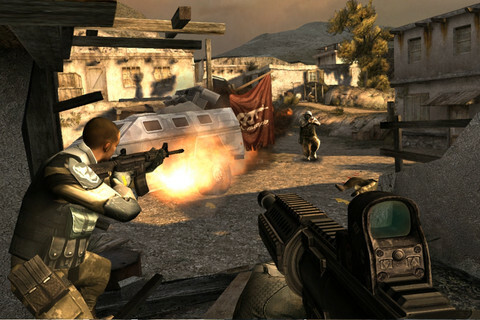 That's when you'll dive into multiplayer, where up to 12 players with itchy trigger fingers wage war across six unique maps and seven play types, such as Battle/Team Battle (free-for-all), Capture the Flag and also Zone Control, where teams attempt to hold three specific areas for a certain period of time. Jumping into matches is relatively painless, though you should expect the occasional drop and/or screen freeze, prompting a bothersome reboot. Neither of those issues, though, should kill your enjoyment. 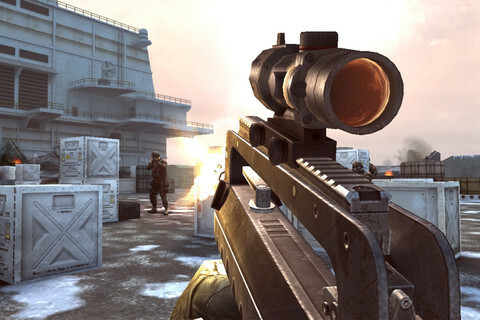 While not as fully featured as Battlefield 3, Modern Combat's MP is quite deep, with detailed stat tracking, a leveling system (you earn XP for almost everything) and Killchains that work in similar fashion to COD's Kill Streaks, which give you access to an air strike, gun turret and even a nuclear weapon. You even have the chance to unlock different weapon load outs and customize guns with scopes, extended clips and grips, though Gameloft occasionally dangles the in-app purchase to stock up on credits. Really, after spending $9.99 for the game? We don't think so. That, however, pales in comparison to the biggest offenders: the fire and aim down the sight buttons, both of which are pathetically small, to the point where you'll die as a result of haphazardly sliding a thumb around the screen, desperately searching for the virtual trigger. Thankfully, there exists the option to make these icons larger and place them anywhere you'd like along the touch screen. All told, Modern Combat 3: Fallen Nation suffers from the same problems that plague many 3D mobile games, but its drool worthy graphics, enjoyable firefights and wealth of multiplayer options make it an obvious favorite, as well as a welcome addition to any virtual warrior's digital library. Oorah. What's Hot: Stunning graphics, well designed analog controls, intense combat, Aim Assist, thoroughly entertaining and deep multiplayer, universal support. What's Not: The occasional freeze, borrows many elements from past first person shooters.